This medication may cause certain severe blood and bone marrow problems (low red blood cells/white blood cells/platelets). This can affect your body's ability to stop bleeding or fight infection. Tell your doctor right away if you develop easy bleeding/bruising or signs of infection (e.g., fever, chills, persistent sore throat). This medication can also cause a serious allergic reaction. Your health care professional will monitor you closely during treatment for any signs of a reaction. (See also Side Effects section. Who should not take Teniposide Ampul? This medication is used with other anti-cancer drugs to treat leukemia and certain cancers. 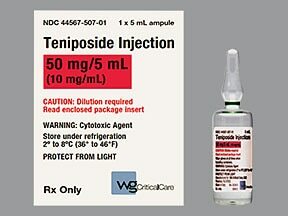 Teniposide works by slowing or stopping the growth of cancer cells. This medication is given by slow injection into a vein by a health care professional over at least 30 to 60 minutes, usually once or twice a week or as directed by your doctor. This medication may cause low blood pressure. Tell your doctor or other health care professional if you feel dizzy. Your injection may need to be stopped or given more slowly. Dosage is based on your medical condition, body size, and response to treatment. Your doctor will check your blood counts to make sure you can receive your next dose. Be sure to keep all medical/lab appointments. If this medication accidentally leaks into surrounding tissue, the skin and/or muscle may be severely damaged. Tell your doctor right away if you feel pain or irritation at the injection site. If this medication touches your skin, immediately wash the area well with soap and water. If this medication gets in your eye, open the eyelids and flush with water, then seek immediate medical attention. What conditions does Teniposide Ampul treat? Nausea, vomiting, diarrhea, drowsiness, and pain/redness at the injection site may occur. Nausea and vomiting can be severe. In some cases, your doctor may prescribe medication to prevent or relieve nausea and vomiting. Eating several small meals, not eating before treatment, or limiting activity may help lessen some of these effects. If these effects persist or worsen, tell your doctor or pharmacist promptly. Many people using this medication may have serious side effects. However, your doctor has prescribed this medication because he or she has judged that the benefit to you is greater than the risk of side effects. To lower your risk of serious side effects, your doctor will follow your condition closely and order lab tests. Tell your doctor right away if you have any serious side effects, including: headache, dizziness/fainting, bloody/black/tarry stool, unusual weakness/tiredness, coughing up blood, severe abdominal pain, slow/shallow/rapid breathing, mental/mood changes (e.g., confusion, difficulty staying awake). A very serious allergic reaction to this drug is unlikely. However, get medical help right away if you notice any of the following symptoms of a serious allergic reaction: fast/irregular heartbeat, flushing of the face, rash, itching/swelling (especially of the face/tongue/throat), severe dizziness, trouble breathing, fever/chills. List Teniposide Ampul side effects by likelihood and severity. Before using teniposide, tell your doctor or pharmacist if you are allergic to it; or if you have any other allergies. This product may contain inactive ingredients (such as polyoxyethylated castor oil), which can cause allergic reactions or other problems. Talk to your pharmacist for more details. Tell your doctor your medical history, especially of: current infections, certain virus illnesses (herpes, chickenpox), liver problems, kidney problems, blood disorders (e.g., anemia, clotting problems), Down syndrome, low blood proteins (hypoalbuminemia). Wash your hands well to prevent the spread of infections. Avoid contact with people who have illnesses that may spread to others (e.g., flu, chickenpox). To lower your chance of getting cut, bruised, or injured, use caution with sharp objects like razors and nail cutters, and avoid activities such as contact sports. This product contains alcohol. Caution is advised if you have alcohol dependence or liver disease. Ask your doctor or pharmacist about using this product safely. This medication may lower sperm count or cause abnormal sperm to form. These effects can possibly cause infertility or birth defects. Consult your doctor for more details. This drug is not recommended for use during pregnancy. It may harm the unborn baby. If you become pregnant or think you may be pregnant, tell your doctor right away. To avoid pregnancy, both males and females using this drug should use reliable form(s) of birth control (e.g., birth control pills, condoms) during treatment. Consult your doctor for details and to discuss effective forms of birth control. It is not known whether this medication passes into breast milk. However, it may have undesirable effects on a nursing infant. Therefore, breast-feeding while using this medication is not recommended. Consult your doctor before breast-feeding. What should I know regarding pregnancy, nursing and administering Teniposide Ampul to children or the elderly? Some products that may interact with this drug include: live vaccines (e.g., flu vaccine inhaled through the nose, typhoid/polio vaccine taken by mouth), "blood thinners" (e.g., warfarin, enoxaparin), salicylates/NSAIDs (e.g., aspirin, ibuprofen, naproxen, sodium salicylate), drugs that may interact with alcohol (e.g., disulfiram, metronidazole), methotrexate, sulfonamide antibiotics (e.g., sulfamethizole). Tell your doctor or pharmacist if you also take drugs that cause drowsiness such as: certain antihistamines (e.g., diphenhydramine), medicine for sleep or anxiety (e.g., alprazolam, diazepam, zolpidem), muscle relaxants, narcotic pain relievers (e.g., codeine), psychiatric medicines (e.g., chlorpromazine, risperidone, amitriptyline, trazodone). Check all prescription and nonprescription medicine labels carefully since many contain pain relievers/fever reducers (NSAIDs such as ibuprofen, naproxen, or aspirin) that can increase your risk of bleeding. Low-dose aspirin should be continued if prescribed by your doctor for heart attack or stroke prevention (usually at dosages of 81-325 milligrams a day). Consult your doctor or pharmacist for more details. Does Teniposide Ampul interact with other medications? Laboratory and/or medical tests (e.g., complete blood count, liver tests, kidney tests) should be performed periodically to monitor your progress or check for side effects. Consult your doctor for more details. Not applicable. This medication is given in a hospital or clinic and will not be stored at home.Information last revised December 2016. Copyright(c) 2016 First Databank, Inc.
Are you taking Teniposide Ampul? Are you considering switching to Teniposide Ampul? How long have you been taking Teniposide Ampul?